I don’t normally do this, so I hope you will forgive me, just this once. 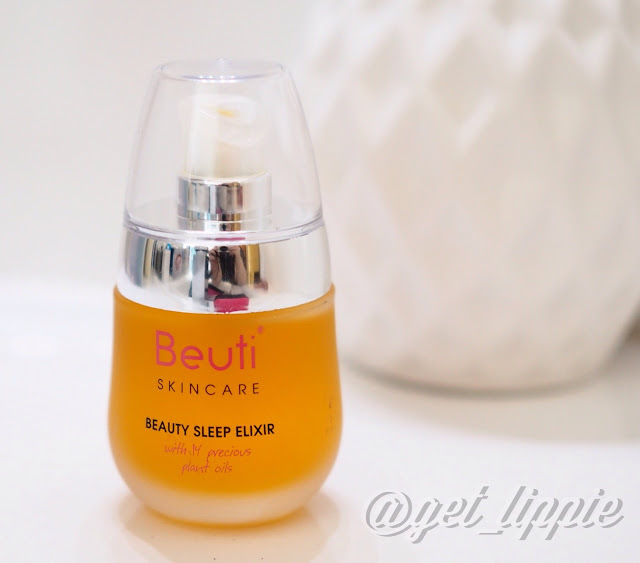 It’s exceedingly rare that I feature a skincare product after less than a month (minimum) of use, but this little bottle of golden elixir, Beuti Skincare’s Beauty Sleep Elixir appears to be quite magical. If you’ve been a Get Lippie reader for a while, you’ll know I’m prone to both sensitivity and redness. My redness is usually caused by inflammation from my various sensitivities, or vaso-dilation caused by heat, or factors such as too much sugar and/or alcohol, rather than a specific skin condition such as rosacea. I am always on the lookout for products that either promise to protect my skin from external irritation, or to help heal it when it’s at its reddest and most uncomfortable – some of you might have noticed that I use a lot of anti-oxidant serums to protect my skin. Beuti Skincare‘s recent press release mentioned “anti-inflammaging” (a quite frankly horrific phrase, but …), meaning their products are both anti-inflammatory and anti-ageing, so I was intrigued to try. Sea Whip extract is a known anti-inflammatory, and lavender and neroli are both known for their soothing properties. I had some inflammation recently (in fact, I spent a couple of days in the office last week flushed redder than a stop sign thanks to a bad cosmetic choice or two), and I chose to set aside my usual soothing products and try Beuti Skincare Beauty Sleep Elixir for a night or two instead. I’m very glad I did. Skin looks instantly less reddened when you use an orange-yellow beta-carotene rich oil, as the deep gold instantly counteracts redness in the same optical way a yellow powder does, so you’ll instantly feel and look better. Used overnight, I woke up to find that not only had my beacon-esque redness disappeared completely, but the under-skin bumps that are a signature of irritation on my skin had also completely gone. This is unheard of for me in the first use of a healing product – I normally have to stick to a low-impact, low-active regime for at least a week or so in order to get rid of incipient irritation, even with tried and tested products. I was a little amazed. I’ve not been able to stop applying it to my face ever since. My skin is velvety smooth, and even and without even a hint of greasiness. The instructions say to use three pumps, but I’ve been using one or two at most. Can I call it love after less than a week of trials? It’s certainly been a whirlwind romance! I’m going to need a backup bottle already, I can tell. You can buy Beuti Skincare Beauty Sleep Elixir from Look Fantastic, (not an affiliate link) where it will cost £42. A bargain, in my eyes. The Fine Print: PR sample. Get Lippie has not been compensated for this review, and there are NO affiliate links in this article.